LeasePlan has revealed more details on its forthcoming end-to-end EV proposition in line with its continued work on helping fleets transition to low and ultra-low emission vehicles. Due for launch in Q1, the proposition will include the latest electric vehicles and provide for charging infrastructure implementation at customer offices and employees’ homes, as well as full split billing. The scheme will also see LeasePlan work together with its partners to ensure electricity used to charge cars is 100% renewable wherever possible and to offer comprehensive fleet reporting, showing a fleet’s carbon dioxide performance compared to a benchmark of global companies. Other features include emissions offsetting for remaining fleet petrol and diesel vehicles, employee engagement tools and materials to help engage employees with the shift to EVs plus a monthly online ‘Pulse’ check with drivers to help LeasePlan understand satisfaction rates and to enable them to rapidly address any emerging issues. The launch of the scheme is in line with LeasePlan’s ongoing work on the EV100 global initiative – the leasing giant has already said it plans to have all its employees driving electric cars by 2021 as well as helping to migrate its customers to EVs. Yesterday also saw the firm hold its ‘Road to Net Zero Emissions by 2030’ event at the Electric Vehicle Experience Centre, Milton Keynes. 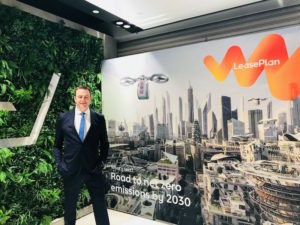 This included a talk from LeasePlan UK’s managing director, Matt Dyer, on what’s driving the need for increasing fleet sustainability while head of consultancy services Matthew Walters discussed how to lower fleet emissions. As well as an electric vehicle ride and drive experience, delegates heard via video message from LeasePlan CEO Tex Gunning, who is currently attending the World Economic Forum Annual Meeting in Davos with the aim of accelerating the zero-emission mobility revolution. Other new LeasePlan services include its 360 formula, which aims to identify opportunities to reduce overall fleet costs whilst improving driver safety and reducing environmental impact.